Last week was drenched in rain and storms followed by a beautiful sunshine filled weekend. We were so excited to see the sun we stayed outside all weekend and have the sunburns to prove it. And now it seems we’re back to the drizzle, damp, chilly air. Week after week of rain starts to get old—I’m over it. To help get me through, it’s all tea and soup, snugly sweaters and rain jackets, and candles and cozy blankets. Yesterday I even enjoyed a cup of coffee with a doughnut smack dab in the middle of the afternoon. All this rain must really be getting to me! Another week of drizzle and I may not be able to zip up the ol’ skinny jeans! Not to mention, I’m starting to wonder where I’ll be hiding the muffin top once the sun returns. So yesterday I allotted myself some time out in the garden. But with all the soggy mess and wet grass, I opted for a bit of a pillow shuffle and play on the sun porch instead. Pillow shuffling and candles can really make all the difference during these long bouts of dreary weather. Sometimes a tiny bit of joy is all it takes to turn around a dreary day. And candlelight and foofing always seem to do the trick. Are you with me? 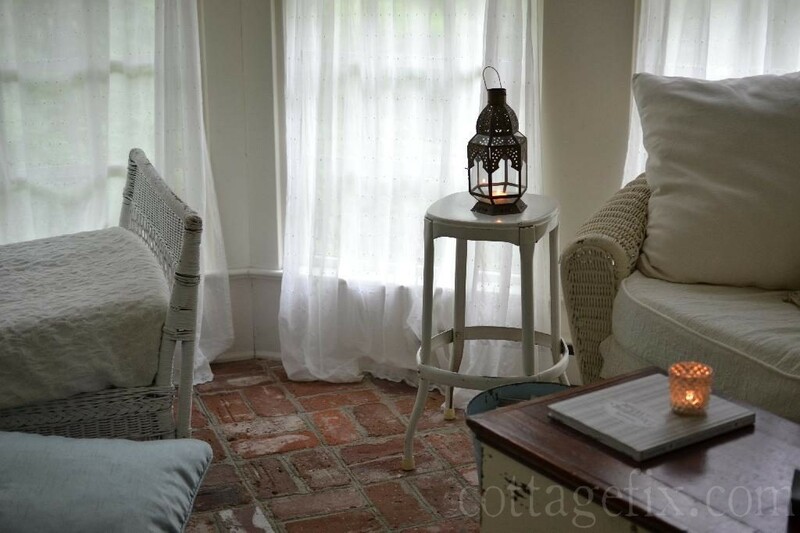 This entry was posted in cottage decor and tagged accessories, cottage, cozy, decorating, pillows on May 11, 2016 by sally. I’m sorry to hear that you’ve been having lousy weather. I hate long bouts of rain and clouds. It makes me depressed. I like the idea of burning candles though. That should add some coziness to your home. Your pillows are all so pretty too. 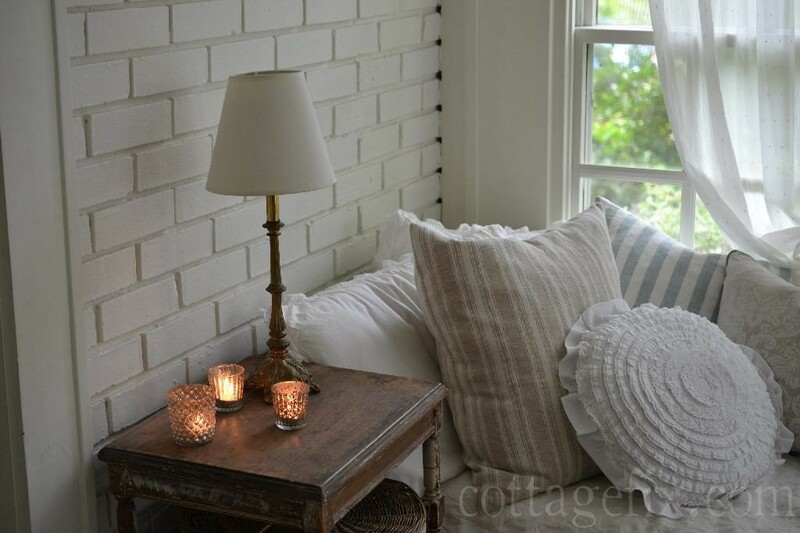 I love the white painted brick wall in your sunroom. If I had any brick in my home, I would paint it immediately like that! Such a pretty look. 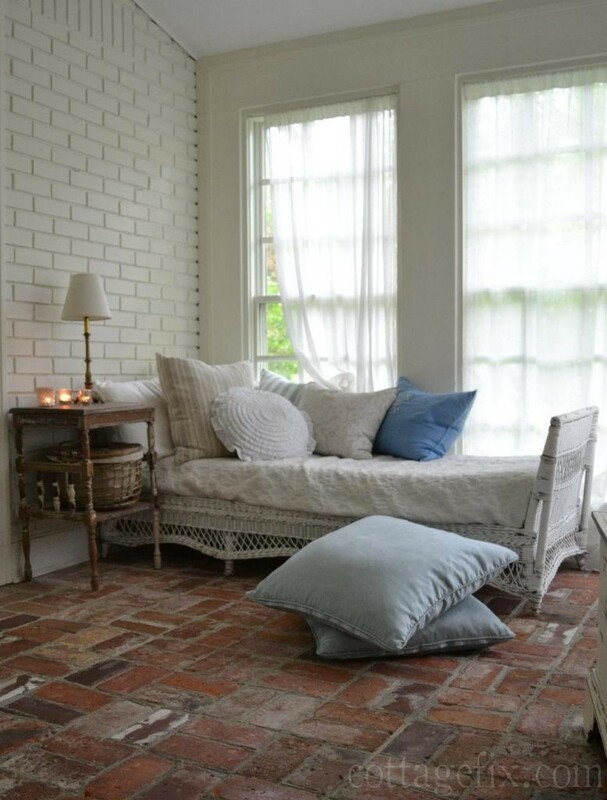 Yes l know what you mean about the rain…it’s been raining on and off for a few weeks now here in Oz….yes with all that soggy soil a rearrange inside would be a lot more enjoyable:-) Gorgeous sunroom and l love the fresh blue cushions you’ve used and l also the painted brick walls contrasting with the unpainted ones on the floor…wishing you warm and sunny days ahead. You always find the best pillows! I love the rain but, then again, I haven’t lived in a very rainy part of the world since I was a kid. It does rain a lot here in the summer but it comes in and then goes so quickly and we’re right back to blue sky and sunshine…so not consistent enough to get to me too much. I love having afternoon coffee and do it quite frequently…and yes, I’ve also been known to have an afternoon glass (or two) of wine:) Enjoy that cozy room! Thanks Victoria! The pillows are all RA and Simply Shabby Chic from target. I collect them when they’re on sale.Wink! I remember experiencing those quick rains while vacationing in Florida, just enough to cool you off for a moment. You have created such a lovely, comfy looking spot. the perfect place to hang out on a windy, raining day. Love it. 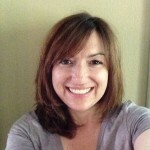 I love these rain filled days, it really gives me a good reason to tweak my home a bit, get creative with pieces swapped out to another room…. Any name for this room would sum up to be a beautiful room. I know this room would hold my attention for days. 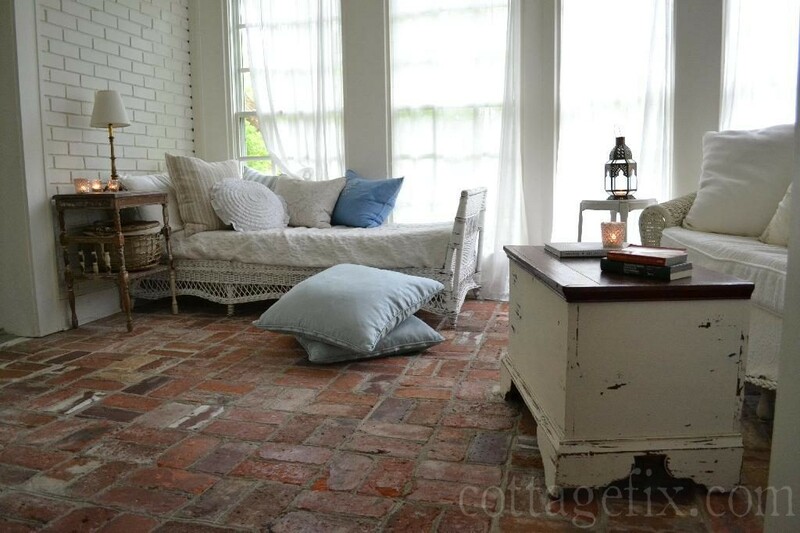 I could see this room in every cottage industry magazine out there. 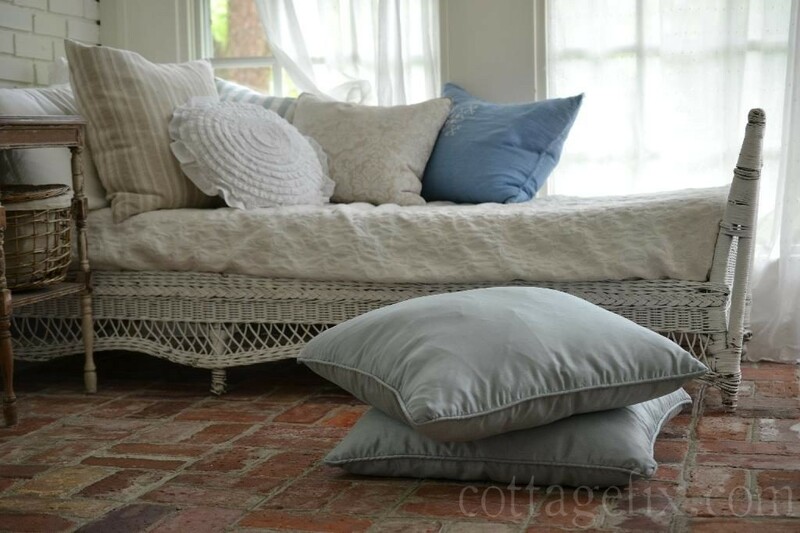 I love the day-bed, a perfect place to drift away on those rainy days. I wish I could send you some rain. It looks like we’re finally getting a couple of days of the fleeting sun which is so welcome around here. I love that daybed too. I found it in the backroom storage of an antique store. It needed a bit of reinforcement and a new cushion. I was planning on having a cushion cover made for it, but wrapping and tucking a quilt seems to work just fine so there’s no need. This is my favorite room in your house. Every way that you have styled it, I have loved it. 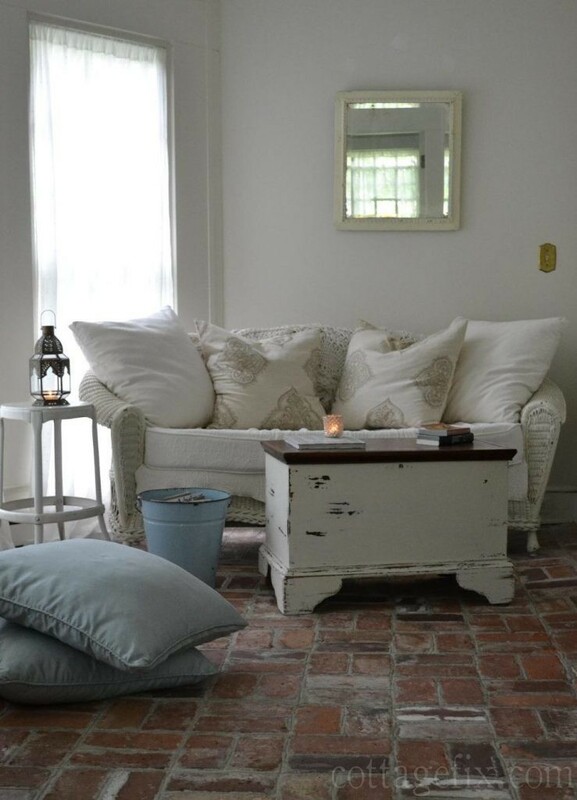 So restful in its bohemian subtlety.